i suppose i fancy myself a bbq connoisseur. i have a sentimental fondness and affinity for that sticky-sweet-tomatoey-carson’s-type of sauce (not that i’d complain about l. woods either). however, having lived in the deep south for many years, i also appreciate that pit-wet-and-dry-smokey-vinegary thing as well. 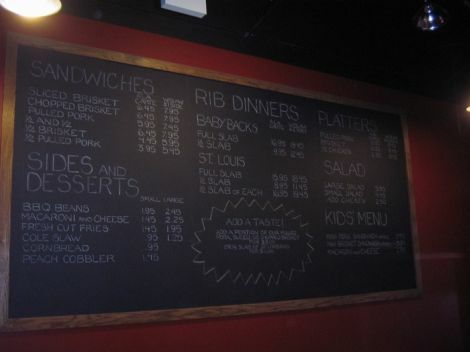 so was i happy when smoque opened in the irving park neighborhood. you need balance, right? smoque is a little place, with an somewhat unfortunate name, on a well-traveled corner. it’s very clean and well-lit, and there are about 20 simple wooden tables with chairs, all of which were filled when we arrived. that was about 6 months ago. they’re still continuing to be filled to date. there’s an open kitchen with a counter with a friendly waitstaff, where you place and pick up your order. 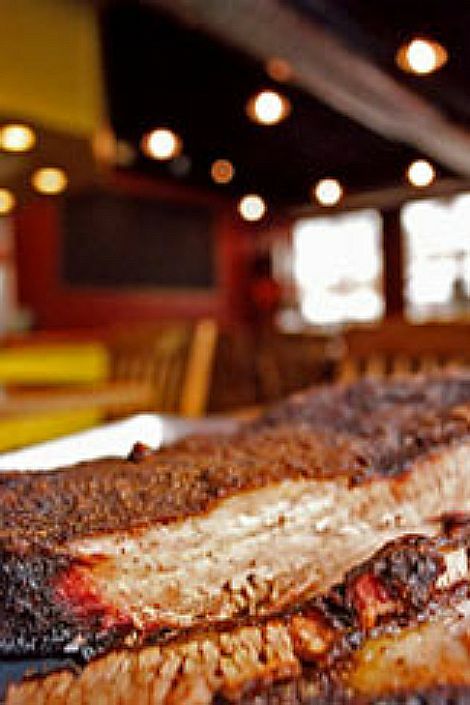 the nice-sized, tender brisket and pulled pork sandwiches and platters have a terrific depth of flavor, with that smoky tang that takes you to the carolinas, or memphis, or someplace down there. individual tinfoil ramekins of cornbread and mac and cheese are noteworthy complements, and the bbq beans should not be missed. they do a nice salad that you can add chicken to, and they serve it with a creamy ranch dressing that makes it very rich. add a few drops of sauce to that dressing for a bit more piquancy, and you can’t go wrong. all in all a lovely experience, comforting and reasonably priced.